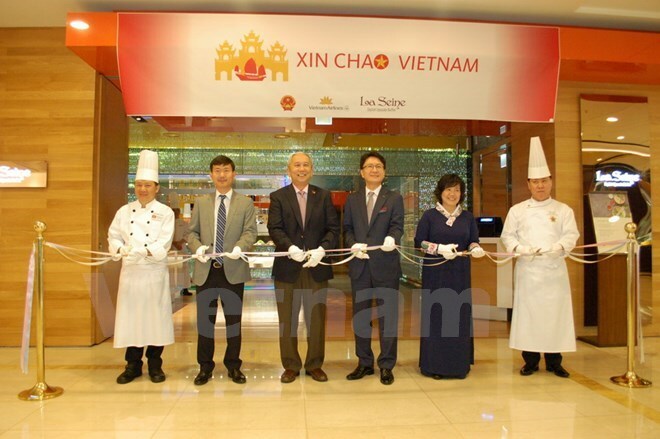 Seoul (VNA) – A Vietnamese culinary month was jointly launched by the Vietnamese Embassy in the Republic of Korea (RoK) and Lotte Seoul Hotel on August 24 in the RoK’s capital city of Seoul. Titled “Hello Vietnam”, the event, which was held with the support the national flag carrier , is one of the events celebrating the 25th anniversary of Vietnam-RoK bilateral diplomatic relations (December 22, 1992 - December 22, 2017). At the event, Vietnamese Ambassador to the RoK Nguyen Vu Tu was said he was delighted with the thriving relations between the two countries in every field from politics, economy to people-to-people exchange. He said the Vietnamese culinary month is an important event promoting Vietnamese culture to Korean people and international friends, helping them gain better understanding and experience the beauty and uniqueness of Vietnamese cuisine cooked by Vietnamese chiefs. Meanwhile, a representative of Lotte Seoul Hotel appreciated the Vietnamese Embassy’s support in implementing the event, pledging to continue working to tighten the Vietnam-RoK ties, especially in culture and people-to-people exchange. Vietnamese chiefs attending the event said that they were proud to showcase Vietnam’s delicacies such as spring rolls and pho (Vietnamese noodle soup) to the RoK, which shares historical and cultural similarities with Vietnam.